London has a huge plant-based food scene and we were very happy to enjoy a weekend full of delicious vegan food. Our favorite? 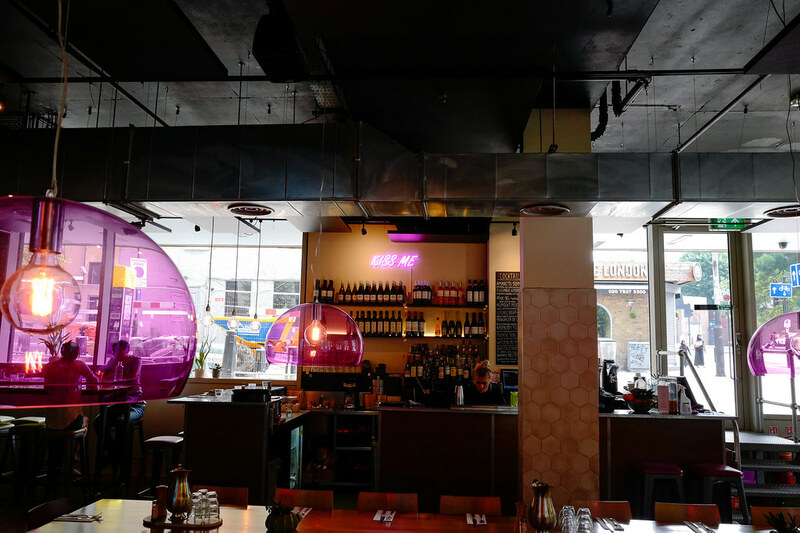 Mildreds, the vegetarian restaurant in Kings Cross. For me, there is nothing better in the morning than a big tasty brunch. So we decided to check out the famous Mildreds restaurant before heading to Camden Market. 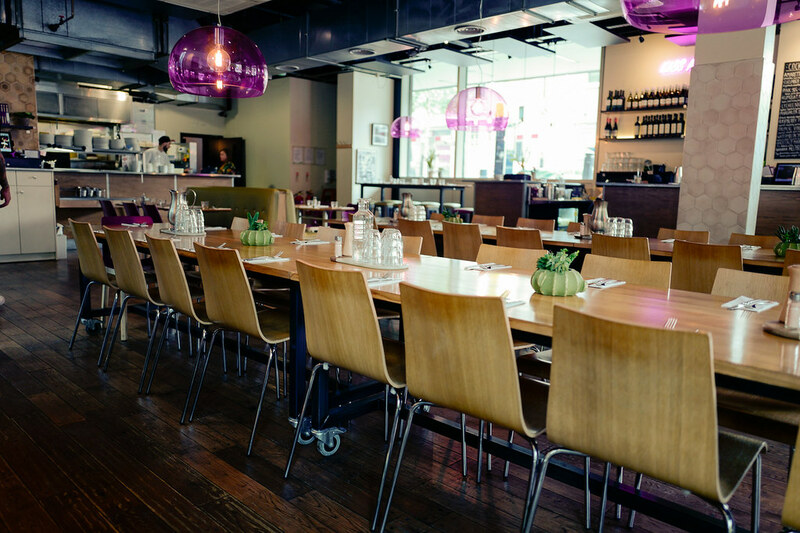 Mildreds is a small restaurant chain with four restaurants in London. The booking policy is very simple, groups under 10 people just come by without having to reserve a table in advance. We visited the branch in Kings Cross and weren’t disappointed. The restaurant has an open kitchen, which is awesome! You can smell the aromatic ingredients throughout the whole restaurant. We decided to go with the big brunch, of course. It can be ordered as a vegan and vegetarian option, a gluten-free option is also available. So whats on that plate? 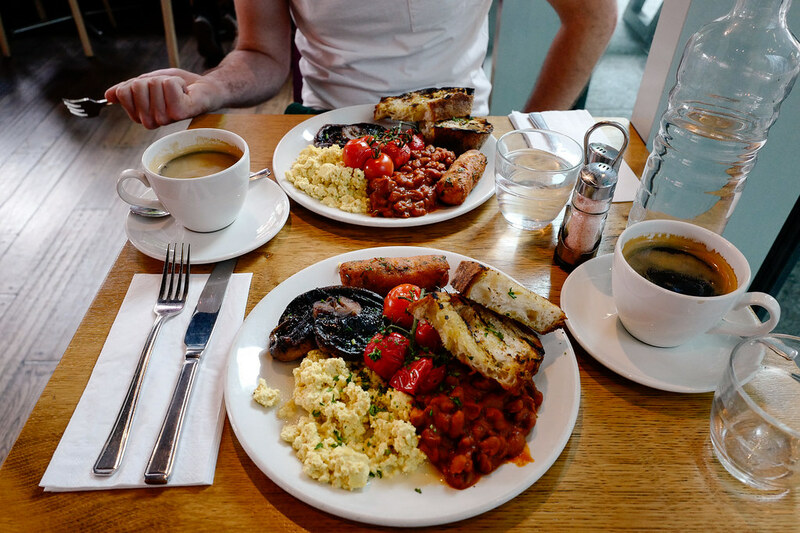 We had organic scrambled tofu with slow roasted tomato, oak smoked house beans, roasted tarragon mushrooms and toasted sourdough. Actually, we wanted to order at least two different meals, but we both wanted this big brunch so badly, that we didn’t order a second dish. And it really was outstanding! The tarragon mushroom was as big as my fist and tasted exceptionally good! I really recommend to go with the big brunch, it’s basically like a typical English Breakfast, just without the bacon. And the other dishes also sound very delicious. If you have a sweet tooth maybe the blueberry waffles with maple syrup and coconut cream is the right breakfast for you. They also have main dishes like vegetable bowls, burgers, and falafel. If you have an allergy, you can have a look at the Mildreds allergens menu, where all tricky ingredients are listed. ON THE MENU: Brunch from sweet waffles to hearty beans and scrambled eggs and main dishes like green falafel and all kind of vegetarian burgers. PRICES: Brunch around 9 pounds, main dishes 12 pounds, sparkling mineral water 3 pounds and cocktails 7,50. VIBES: Very modern with purple accents. DOWNER: Alcoholic beverages are served from 12 midday onwards. So no glass of champagne will be served to your brunch before 12. PICKY NOTES: Vegetarian, vegan, gluten-free options and an allergens menu. Mildreds, 200 pentonville rd, london, n1 9jp. Website. Evie worked in the hotel business for a few years before moving to Berlin. She studies Digital Media Culture at the Filmuniversity in Babelsberg and is interested in film, fashion, and food. Two years ago, she decided to swap Schnitzel for Tofu – and is still more than happy with it! You can follow her on Instagram @evie.efeu. Do you want to be a part of our team of picky eaters and share your favorite restaurants and cafés? Write us: hello@picky-eaters.de. We’re looking forward to meeting you!